May | 2014 | In Domino Spera! Why the Crucifix during Easter? As we celebrate the Resurrection of Christ and the Easter Season the question inevitably arises about why we continue to display Christ crucified on the Cross: shouldn’t we show Him as risen; the Cross as empty? At first, Crosses were usually bare, without a corpus (Latin for ‘body’). What had been an instrument of torture quickly became synonymous with Christianity, and for the baptised, it was a symbol of hope and salvation. In the 4th century, as the Church began to be public, the Cross appeared openly in art and architecture, and adoration of the Cross, as on Good Friday, started. As Christianity grew, Christian art moved from allegorical (symbolic, figurative) to more realistic representations. In the late 6th century, we begin to see drawings of the Crucifixion as expressions of personal piety. By the 9th century, the Crucifix (a Cross with the body of Jesus) becomes more common, but Jesus isn’t suffering: while He’s nailed to the Cross, He’s alive; triumphant, glorious. 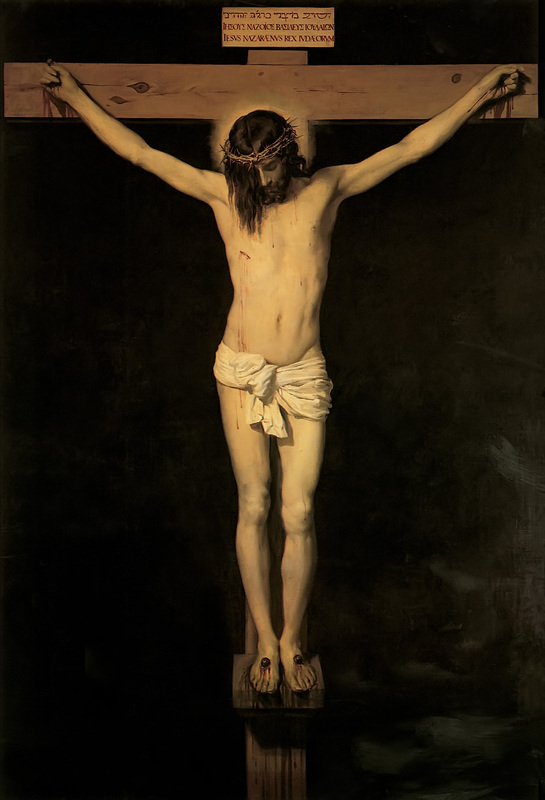 As realism grew in art, the Crucifix shifted to the suffering Christ. 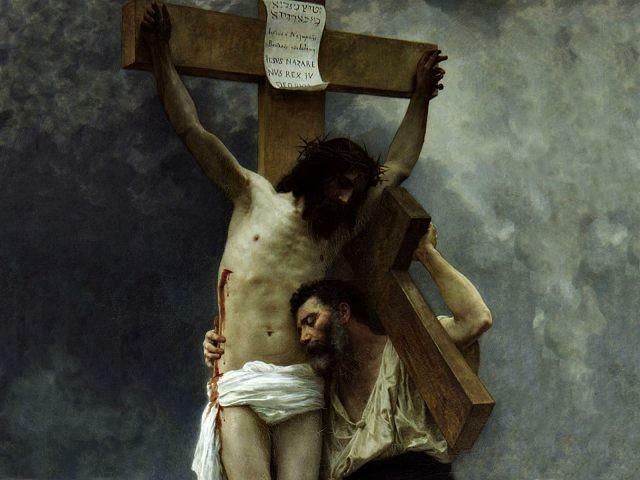 By the 13th century, Crosses almost always had a figure of Christ in His agony. This was to arouse in the faithful greater sorrow for sin and deeper love for Christ. But it was also tied to the biblical theology found in the writings of St. John and St. Paul. St. Paul tells us he wanted to know nothing… except Jesus Christ, and Him crucified (1 Cor 2:2), and that we proclaim Christ crucified (1 Cor 1:23). In his Gospel, John holds that Jesus’ purpose, His ‘hour’, was the Cross: When you have lifted up the Son of Man, then you will realise that I am He (Jn 8:28); and, They will look on the one whom they have pierced (Jn 19:37; cf. Zec 12:10). In the book of Revelation, St. John also describes his vision of the Heavenly Liturgy, which takes place before the Lamb, who has been slaughtered but is alive (Rev 5). The Crucifix, then, is a sign of Christ’s victory over sin because it’s on the Cross that Jesus atoned for our sin. But it’s also a sign of His victory over death — a sign of the Resurrection —, because it’s on the Cross that Jesus revealed His glory, where He humbled himself and became obedient to the point of death, so that the Father might exalt Him up and give Him the name that is above every name (Phil 2:5-11). The Crucifix is not a denial of the Risen Christ; rather, it’s a powerful reminder of the Father’s love and the Son’s fidelity, and a symbol of Jesus’ glorious triumph.It’s for these reasons that the Crucifix has a place of honour in Catholic faith and worship: Christ’s humility is our glory, His shame is our honour, His suffering is our salvation… (cf. 2 Cor 8:9) And we want to remember this every day, especially at Mass, even during the Easter Season. Comments Off on Why the Crucifix during Easter? Ps 23 R/. The Lord is my shepherd; I shall not want. Today, the fourth Sunday of Easter is commonly called ‘Good Shepherd Sunday’ because the Psalm, the Second Reading and Gospel for today all speak to us of Christ our Shepherd. As most of us know, I’m sure, the metaphor of the shepherd was something well understood in the days of Jesus (and even well before that), because, in the regions of Israel and the Middle East, the shepherd was (and still is) a very common and important job. So when Jesus spoke of the shepherd and the sheep-gate, everyone had a pretty good sense of what He was talking about. It would’ve been the equivalent of a sport or business metaphor for us today. Now, most of us today are pretty unfamiliar with shepherding, though we kind of have an idea of what it’s like, especially if we have any knowledge of farming. But that’s only the literal/practical understanding of shepherding. Since Jesus is using ‘shepherd’ as a metaphor, it means there’s also a symbolic meaning attached to it, and that’s what I’d like to open up today. First of all, the image of the shepherd in relation to religious leaders and to God was quite an ancient one for the Jewish people: remember, Abraham, Jacob and Moses were all shepherds… So for us to understand more fully what Jesus is saying to us in today’s Gospel, we really need to look back into the Old Testament for answers. And perhaps the best place to do that is to look at Ezekiel 34, where Ezekiel prophesies that, since the religious leaders aren’t being faithful, God Himself will become the shepherd of Israel. We will see in the verse immediately following today’s Gospel that Jesus fulfils that very prophesy, when He says, I am the good shepherd (Jn 10:11). So what does Ezekiel tell us about God as a shepherd? Well, he says, I myself will be the shepherd of my sheep, and I will make them lie down, says the Lord God. I will seek the lost, and I will bring back the strayed, and I will bind up the crippled, and I will strengthen the weak, and the fat and strong I will watch over. I will feed them with justice (Ez 34:15-16). The Good Shepherd seeks, brings back, binds up, strengthens, watches over and feeds. And we see throughout the Gospels that Jesus perfectly corresponds to this image: He, the Son of God, came down to earth and became a man to seek out His beloved creatures, His lost brothers and sisters, so that He might bring us back to the Father. And He does this seeking and bringing back by healing the blind and the lame, by raising the dead to life, by sharing the love and mercy of the Father, by preaching the Good News of the Kingdom, and finally by laying down His life on the Cross to free His sheep from their sins and raising them to new life with Him at the Resurrection. And only Christ has done this: no one else is God made flesh; no one else died for our sins; no one else has been raised from the dead to experience the glory of the Father… Only Jesus Christ is the Good Shepherd; all others, as He says, are thieves (cf. Jn 10:8). But Jesus also chose to associate His Apostles to this ministry of shepherding when He told Peter to feed and tend His sheep (Jn 21:15, 16). That’s why the Church calls her Bishops and Parish Priests ‘Pastors’, for they are to shepherd in the manner of Christ, the Good Shepherd. 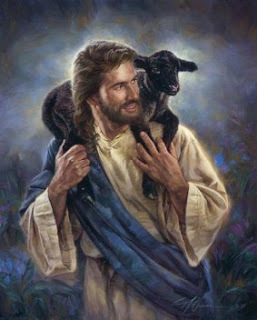 And that’s why she also asks us, on this Good Shepherd Sunday, to pray for vocations, especially for an abundance of good and holy Priests who will shepherd God’s people with the heart of the Good Shepherd, who will lay down their own lives so that God’s sheep may have life and have it abundantly (Jn 10:10). Let us, then, pray for an abundance of such Priests; pray for those who are discerning this vocation, that they may have to courage to answer; pray for those who are already Priests, that they may remain faithful to their ministry; pray for those who are now in retirement, giving thanks to God for the lives they laid down for our sakes. Lord of the harvest, send us many good and holy labourers into your vineyard! Amen. Ps 16 R/. Lord, you will show me the path of life. 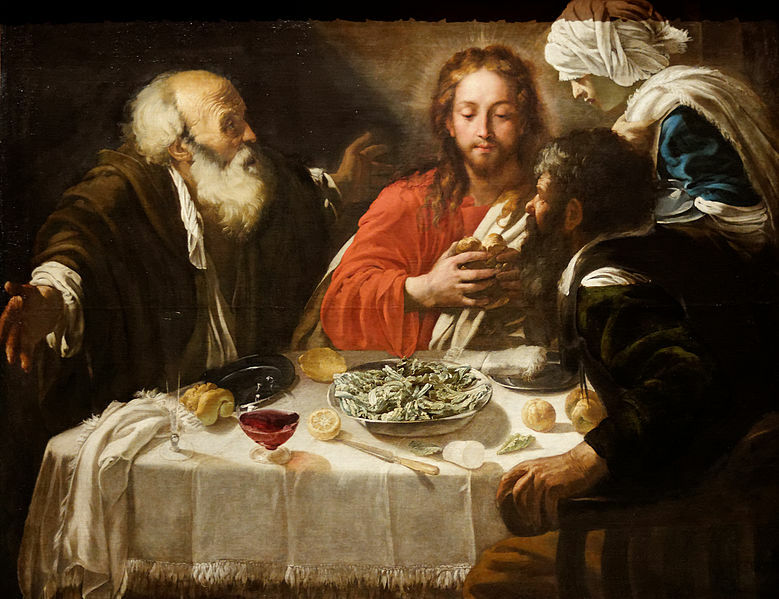 Christ and the Disciples in Emmaus, by a follower of Caravagio. Kunsthistorisches Museum, Vienna. This picture is a mirror image of a composition by Caravaggio (London National Gallery) dating from around 1600. My brothers and sisters, as we continue to celebrate the holy Season of Easter, we continue to rejoice in God’s overwhelming love and mercy: a mercy that’s far greater than our weakness, far stronger than our sins; a love that’s much more powerful than even death itself. What a gift! And it’s in this gift of salvation that we continue rejoice; this free and undeserved gift of God’s love and mercy given to us in the person of Christ Jesus, and made known to us in the Paschal Mystery. But it’s only through the lens of the Resurrection that the Passion and Death of Jesus make any sense. As we heard in the Gospel, the disciples were sad and confused after Jesus died. My brothers and sisters, it isn’t until the disciples encounter the Risen Christ and receive the gift of the Holy Spirit (cf. First Reading) that they understand how the wisdom and glory of God was manifested through the Cross. And this is the Gospel scene we encounter on the road to Emmaus. The one whom the disciples believed was truly the Messiah, the King who was to rule them and redeem Israel had just died the death of a common criminal (cf. Lk 24:18-21). And now they were hearing stories that this Jesus had risen from the dead. They were sad and confused, and didn’t know what to make of it all. Then along comes the risen Jesus — though they don’t recognise Him —, and He invites them to share and revisit the story of their journey with Him over the past three years. Let’s review this again: the disciples were walking together and Jesus came to them, and they recounted the events that happened on their journey of faith, then Jesus reviewed for them the Scriptures and helped them to understand what happened, and then revealed Himself in the breaking of the bread. Now, doesn’t this sound familiar? Where have we seen this before? Do you see where I’m going with this? We’ve just uncovered the theology and structure of the Mass! At each Mass, we gather together as disciples of Christ walking on our journeys of faith, to revisit and recount the story of our relationship with God, the story of God’s action in our lives. That’s why we always have the reading of Scripture, and we include in that both the Old and the New Testament, because as Jesus revealed to us on the road to Emmaus, Moses and the Prophets all point toward Him as the Son of God, our Messiah (cf. Lk 24:27). Then, when the readings are done, the Priest or Deacon, who ministers to us in the person of Jesus Christ, interprets for us the things about Jesus in the Scriptures. And if Dcn. Ken and I do that well, then your hearts, like those of the disciples in the Gospel, should also be burning within you as we interpret the Word and confirm you in the Faith (cf. Lk 24:32). Then, from the altar we relive the Last Supper and the Crucifixion, as the Priest unites himself to Christ in His sacrifice and takes bread, blesses and breaks it, giving it to you, where, through faith, you cry out with Thomas: My Lord and my God! (Jn 20:28). 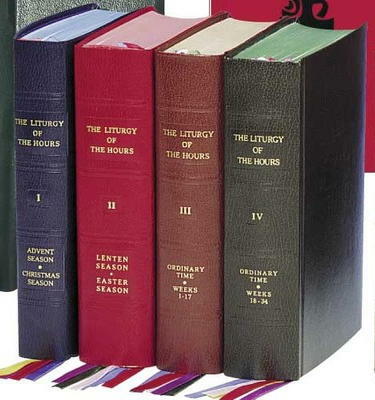 The proclamation of Scripture and the Homily are meant to stir within our hearts and minds the flame of Faith we received at Baptism, so that we might come to recognise the Lord, who reveals Himself to us in the Breaking of the Bread, who gives Himself Body and Blood, Soul and Divinity in the Eucharist. This is what we celebrate at every Mass! This is the heart of our Faith! And the Church gives us the obligation to attend Mass every Sunday because she knows that we need this as the bare minimum to sustain our faith; because she knows that we regularly need to be lifted up and set afire in the Faith, so as not to lose hope and be overcome by sadness like the disciples on the road to Emmaus. Christ is our Light! He is our Life! And if we are to live, we must do so in His light, in His life, and that’s what he transmits to us in the Eucharist, where our bodies receive His Body; where we’re conformed to His likeness, and strengthened in faith, hope and love, so that we too, like the disciples, may have our hearts burning within us and go out to proclaim the joy of the Risen Christ to all we meet (cf. Acts 2:14ff). Because we too, my brothers and sisters, are witnesses to the Resurrection! Each one of us is called to preach and testify that Jesus is the Lord, the Lamb of God who brings us salvation (cf. 1 Peter 1:18-21). This is the joy and hope of our Faith, and we’re called to allow it to overflow into all areas of our lives, into everything we do, everything we say, everything we think. And because this isn’t always easy, we need God’s grace; we need Christ’s victory; we need the Eucharist. This is the gift He’s given us through this Easter Mystery, the gift we’re called to receive, the gift in which we rejoice. May we open our hearts to receive that gift each and every week! Amen.